Legend has been in development at Universal Pictures since October 2012 and has yet to attach a director, though Chris Morgan (Fast Five) and Andrea Berloff (World Trade Center) have both written scripts since the initial announcement was made. Despite the project having a comfortable home at a major Hollywood studio, its presence at Cannes is doubtlessly meant to attract overseas investors in order to offset what could be some mightily considerable costs should it ever go before the cameras. Arnold Schwarzenegger looks quite kingly on the poster, and the man was born to play Robert E. Howard’s Cimmerian warrior and thief, but his box office drawing power ain’t what it used to be if the grosses on The Last Stand (which I loved) and Sabotage (which I haven’t seen) are to be believed. The poster lists Paradox Entertainment as a partner on The Legend of Conan. Paradox co-produced the ill-received Conan the Barbarian reboot from 2011 directed by Marcus Nispel that Lionsgate distributed, so they must have an ownership stake in the property and Universal is keeping them involved to help with the budget and avoid any legal headaches (so I assume). The news front on Legend has been pretty quiet for nearly two years, so it pleases me greatly that it’s still happening and Ah-nuld is involved. He is Conan, end of story. He always brought a brooding intensity to the role, not just his bulging muscles. For some reason the title on the poster is the repetitive King Conan: The Legend of Conan (like it could be the legend of any other king). Over a decade ago, John Milius – the co-writer and director of the 1982 Conan the Barbarian that helped make Schwarzenegger a movie star and still remains the best screen translation of Howard’s creation to date – wrote a script for a prospective third film entitled King Conan: Crown of Iron. It was never made, but at one point Lana and Andy Wachowski were mooted to direct before they instead turned their attention to making the two Matrix sequels. When Milius made the first Conan movie, he intended it to be the first in a thematic trilogy, but it didn’t quite work out that way now did it? Despite having a stroke a few years ago, the man is still alive and kicking and probably would love to return to the character he helped make an icon of the silver screen. I say give Legend of Conan to Milius, sit back, and let the modern classic roll in. He would be a much better choice than whoever Universal and Paradox are destined to hire in his stead. 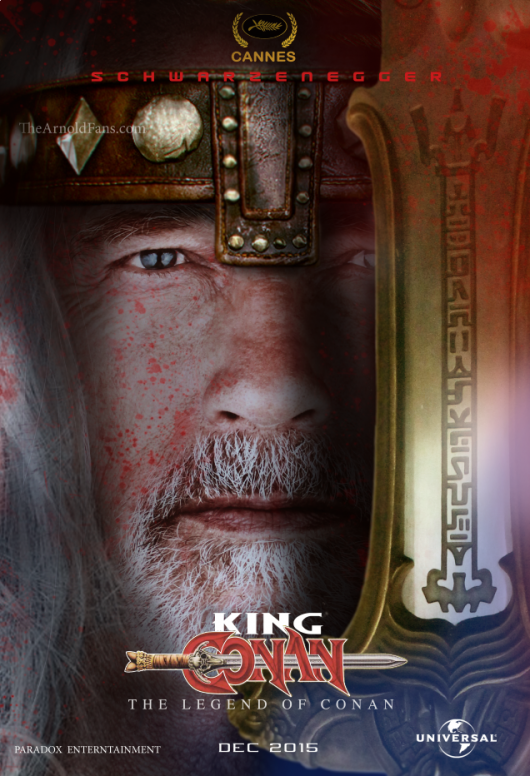 According to the poster, The Legend of Conan has a target release date of December 2015. That’s a little over a year-and-a-half away. Seems like a long time, but it would be worth the wait if we were to get another awesome Conan movie in this lifetime. It would make a nice Christmas gift, too. Who would you like to see direct Legend?